You know how it goes. You’re sitting there with your legs up, lazily exploring the strange and wonderful world via laptop, clicking hither and thither, wandering pretty much aimlessly when you’re suddenly caught by an object of singular beauty. It stops you dead. It wakes you from your stupor. It moves you to action. 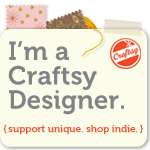 This very scenario happened to me just a little while ago, when my path of discovery lead me to Gingerbread Snowflakes, crafty blog of the one and only, Pam Harris. What did I unearth there? Well, let me tell you. It was this glorious mosaic egg, an egg that Pam had decorated with dyed eggshells. How sweet it was… I pert near swooned. Naturally, I was inspired by Pam’s egg to make a handsome faux-ceramic mosaic vase from eggshells and a plastic maple syrup jug of course. Goodness yes! Here’s what I did. First, I created my vase. I removed the label from the plastic jug and using a handsaw, sawed off the threads at the opening. Then I smoothed the freshly cut mouth of the jug with sandpaper. I was then ready to decorate. The fun part! 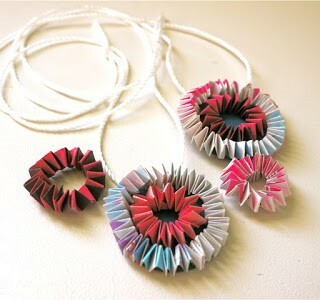 For this project I thought long and hard about the glue type I should use to adhere the shells. Glueing onto plastic can be dicey. I ended up gambling on the same glue I used for the cork stamp project: Aleene’s FunCraft Foam Glue. Foam is a variety of plastic so I figured it would probably work here too. Happily, my gamble paid off. Those egg shells aren’t goin’ nowheres. 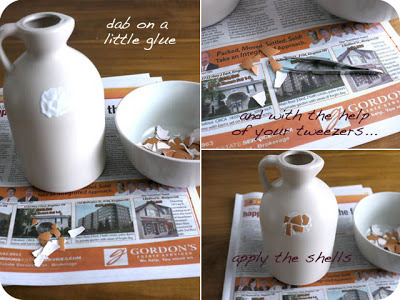 I dabbed on a little glue directly from glue bottle to jug, covered the gluey area with eggshells, and repeated until the desired area was covered. A pair of tweezers came in very handy here to handle and set in place the wee eggshells. On the edges of the eggshell-covered area, I made sure to completely cover any gluey spots with eggshells to ensure a neat and tidy edge. Here’s a super-short (4 second long) animation experiment showing the application of (most of the) eggshells on the jug. My Lo and I were playing. You may have to view it a couple times to actually see the whole thing. It goes by in the blink of an eye. You’ll notice that I used two colours of shells on my vase. 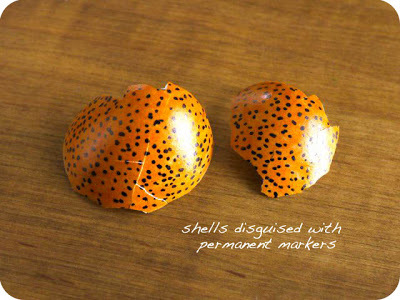 I coloured a few shells with permanent markers (orange and black in my case). Two “lines” of coloured eggshells sandwich the natural brown eggshells. I let the whole thing dry overnight; the glue will still be tacky even once dry. I then carefully gave the area – egg shells only, mind you – a few coats of satin-finish water-based varnish. You could go glossy here if you prefer. I used what I had. Soon as spring arrives, throw in a few pebbles or a bit of sand to balance the weight of flowers, place your spring blooms inside, and presto-change-oh, you have yourself a delightful faux-ceramic mosaic center-piece! All thanks to the internet and Pam. Thank you sweet Pam! Have yourself a fine day now. I’ll be back real soon! Cuteness – put some dandelions or clover in it and it will be so perfectly springy and Easterish I shall swoon and want to photograph it endlessly. Maybe permanent marker will last better. ? Thanks Khadija, you're pretty cool yourself! 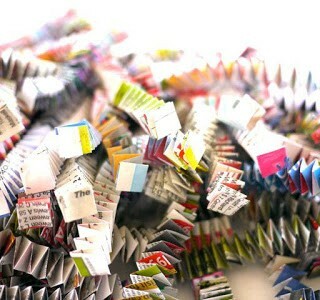 You find the most amazing packaging to upcycle/redesign! Your vase is so innovative! 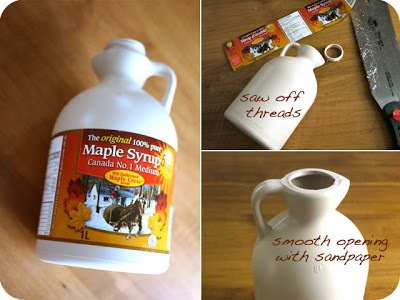 I’ve never seen a maple syrup jar like that! The fun thing is that I never use a package anymore without thinking, what would Michele make of this! 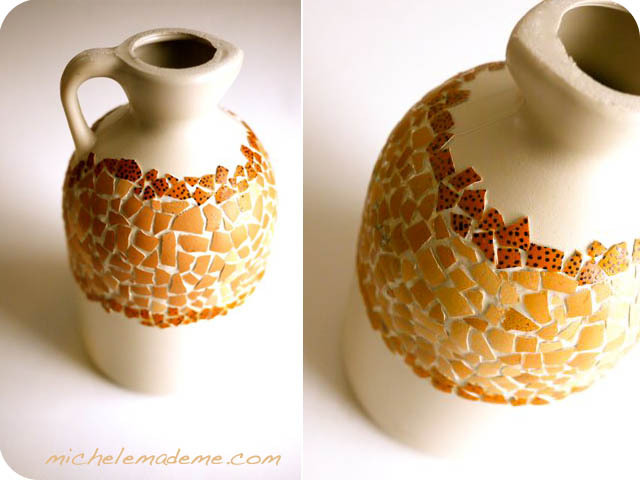 I must admit the jug is adorable decorated with the egg shells! This is a fantastic project Michele!! What a lovely way to display flowers! That jug looks like a million bucks – never would have thought that sawing off the threads would result in that gorgeous classic shape! 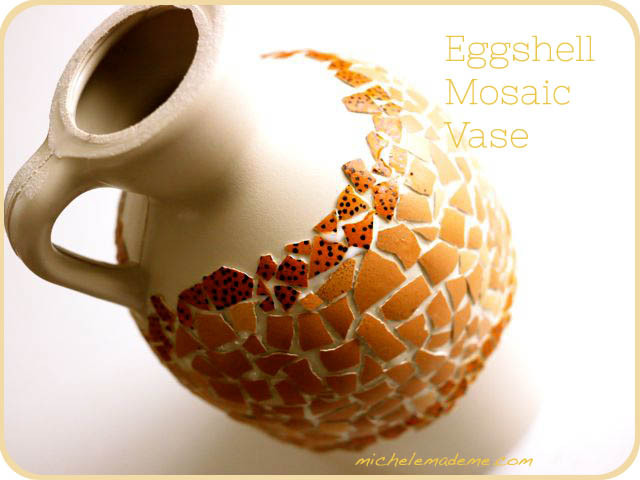 The eggshell mosaic is absolutely perfect with it. Yay, made me happy! Is it me? Am I the only one wondering how many eggs you shelled to complete this project? Also, did you, um, clean them in some way first, or just use them after peeling some hard boiled eggs? I used shells from about 3 to 4 eggs, not hard boiled, to make this project. And yes, it certainly is important to clean the shells before you use them. 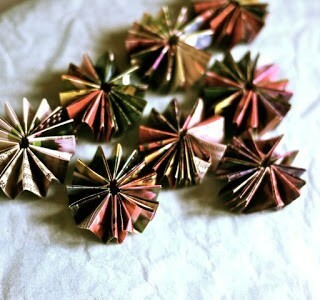 I let mine soak in a sink of very warm soapy water for about fifteen minutes. I then removed them and let them air dry on a napkin. I remember years ago when I was still in my teens (we won't say how many that was o course) I did some eggshell mosaic, but i dyed the shells with food colouring first. I LOVE your sharpie on brown eggs. So very earthy and Savanah plains(ish). sorry about gate crashing your comment hele – I am having issues getting my own comments box. @Michele…another fantastic project Michele. I love the earthy tones, it really does look like a real ceramic urn. With Easter coming up soon, will be be seeing more eggscellent projects? oh I see…I get my own comments box once I am in the thick of the party. Okay gate crashing is a go! OMG I can see why you have a million comments on this one! I keep saying "YOU ARE BRILLIANT" and here i am saying it yet again! But you are! I love the "milk pitcher"! 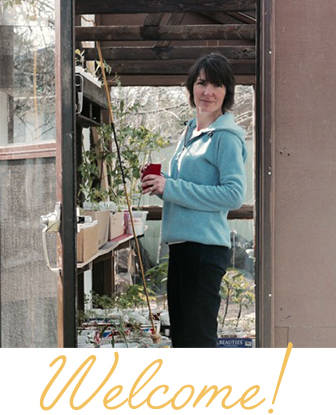 And I am very excited to hear about and try the Aileens funcraft foam glue – and hey – maybe a few of those fifty million black plastic gallon size plant pots I have saved can actually be made into something worthy of more than sitting under the porch! I am wondering – do you think I should consider painting them first before applying the shell bits? Thank you so much for the link to the mosaic egg! I was just cleaning out a shelf a couple days ago and found that I had saved all the unused bits from those kool-aid colored eggs so I have blown out a couple more eggs!! Paint has a tendency to flake off of plastic over time. So, personally, I wouldn't paint your containers before applying the eggshells, I'd just apply the shells directly.